Every sweetie need something sweet for Valentines day. 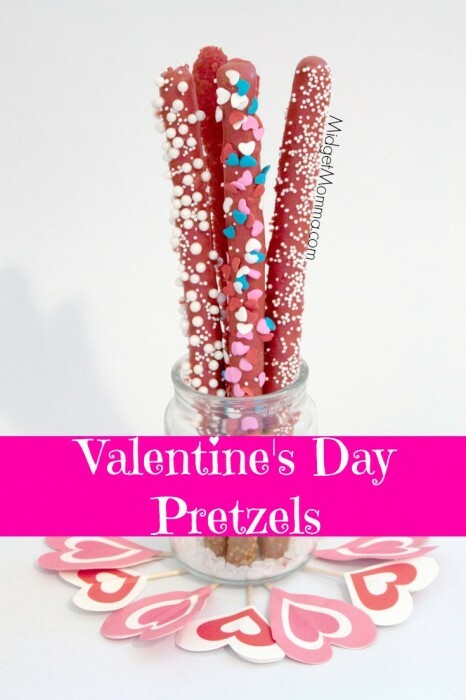 These Chocolate Pretzel Rods may look like they were hard to make but they are very simple. I recommend using chocolate melts so you don’t have to worry about tempering your chocolate. To learn how to make your own colored sugar check out here. I was able to find these cute heart sprinkles at targets dollar section. Pour your chocolate melts and shortening into a tall glass. Microwave for 30 seconds than stir, keep repeating until all the chocolate is melted. Dip the pretzel rods covering most of the pretzel with chocolate. Lay them out on your sheet pan. Sprinkle your choose of sprinkles onto the rods before the chocolate dries. Let the chocolate set for an hour.